Asthma is a chronic inflammatory disease that fails to resolve. Recently, a key role for type 2 innate lymphoid cells (ILC2s) was linked to asthma pathogenesis; however, mechanisms for ILC2 regulation remain to be determined. 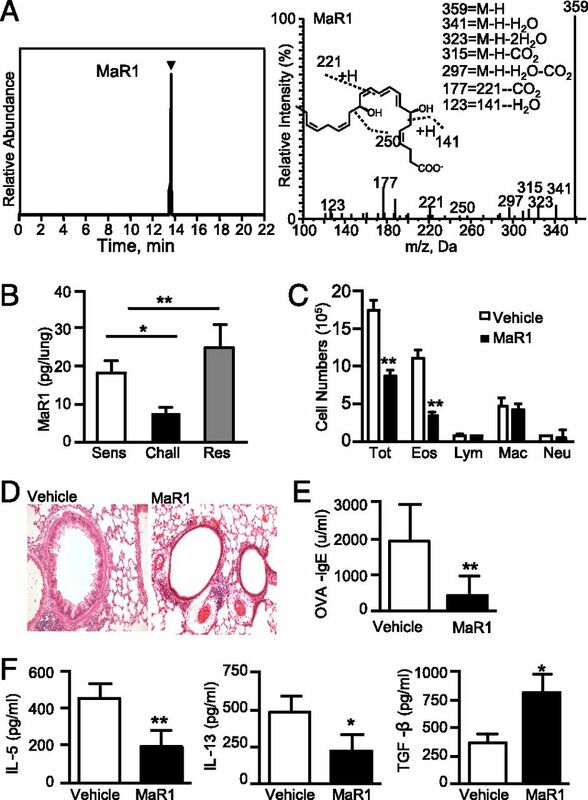 In this study, metabololipidomics of murine lungs identified temporal changes in endogenous maresin 1 (MaR1) during self-limited allergic inflammation. Exogenous MaR1 reduced lung inflammation and ILC2 expression of IL-5 and IL-13 and increased amphiregulin. MaR1 augmented de novo generation of regulatory T cells (Tregs), which interacted with ILC2s to markedly suppress cytokine production in a TGF-β–dependent manner. Ab-mediated depletion of Tregs interrupted MaR1 control of ILC2 expression of IL-13 in vivo. Together, the findings uncover Tregs as potent regulators of ILC2 activation; MaR1 targets Tregs and ILC2s to restrain allergic lung inflammation, suggesting MaR1 as the basis for a new proresolving therapeutic approach to asthma and other chronic inflammatory diseases. Asthma is a chronic inflammatory disease of the lower airways that is classically considered to be mediated by an overzealous CD4+ Th2 immune response (1). The innate immune system, specifically type 2 innate lymphoid cells (ILC2s), was shown to have an important role in the initiation (2) and amplification of allergic inflammation (3–5). Although a number of molecular triggers of ILC development and function have been identified (6), there is a fundamental gap in our understanding of the mechanism(s) by which their effector function is regulated. Dysregulated cytokine production by ILC2s has been linked to the pathogenesis in asthma, as well as other autoimmune diseases (7), but mechanisms to mitigate unrestrained activation of ILC2s are not yet established (8). Specialized proresolving mediators (SPMs) are a family of natural autacoids enzymatically derived from essential fatty acids (9). Recently, the regulation of human ILC2 activation by the SPM lipoxin A4 was identified (10). Airway mucosal levels of the essential fatty acid docosahexaenoic acid (DHA) are reduced in human asthma (11), and select SPMs derived from DHA decrease murine allergic inflammation (12, 13); therefore, the actions of DHA-derived SPMs on ILC2 responses in asthma are of interest. In this study, lipid mediator metabololipidomics of murine lungs identified increased levels of DHA-derived maresin 1 (MaR1) during the resolution phase of self-limited allergic inflammation. Exogenous MaR1 potently regulated ILC2s and lung inflammation, in part via de novo generation of regulatory T cells (Tregs) that inhibited ILC2s in a TGF-β–dependent manner during cell–cell interactions. These results point to a pivotal role for Tregs in the control of ILC2s in a new proresolving mechanism engaged by the SPM MaR1. BALB/c and FvB mice were purchased from Charles River Laboratories. EGFP-Foxp3–knockin (006769) and DO11.10 (003303) mice were purchased from The Jackson Laboratory. Mice were used between 7 and 9 wk of age. All animal experiments were approved by the Animal Care and Use Committee at the Harvard Medical School. The following Abs were used in flow cytometry: anti-CD3 (17A2; BD Biosciences), anti-CD19 (6D5; BioLegend), anti-CD11b Pacific Blue (M1/70; BioLegend), anti-CD49b (DX5; eBioscience), anti-CD25 allophycocyanin (PC61; BD Biosciences); anti-CD90.2 (anti–Thy-1.2; 53-2.1; eBioscience); CD11c (N418; eBioscience); and anti-ST2 (BioLegend), anti-CD4 (RM4-5; BD Biosciences), Foxp3 (FJK-16S; eBioscience), anti-CD62L(MEL-14; eBioscience), anti–IL-13 (ebio13A; eBioscience), and anti–IL-5 (TRFK5; BioLegend). Lungs were harvested at the indicated time points, and metabololipidomics were performed as described and matched to authentic MaR1 (7, 14). MaR1’s physical properties were validated prior to each experiment in accordance with published criteria. Allergic inflammation was induced as described in Supplemental Fig. 1A (12). In experiments involving MaR1, SPM (1 ng/mouse) or vehicle control was administered i.v. 20 min prior to aerosol challenge (Supplemental Fig. 1B). To deplete Tregs, anti-CD25 Ab (clone PC-61.5.3; 350 μg/mouse) or isotype control (rIgG) was administered on days 13, 15, and 17. DO11.10 splenic CD4+ T cells depleted of natural Tregs (CD4+CD25+) were adoptively transferred i.v. (3*106 cells/recipient) just prior to aerosol challenge on day 13. Twenty-four hours following adoptive transfer, the mice were subjected to aerosol challenge. Lung cells were enriched via negative selection using a CD4 Isolation Kit (Miltenyi Biotec) and sorted for naive CD4 T cells (CD44loCD62LhiCD25−). Cells were stained with anti-CD4–allophycocyanin, and Tregs were sorted as CD4+Foxp3+ (EGFP) from EGFP-Foxp3–knockin mice. Innate lymphoid cells (ILCs) were sorted as shown in Supplemental Fig. 2A. ILCs were cultured overnight with IL-7 (BioLegend), followed by 4 h of PMA/ionomycin stimulation in the presence of GolgiStop to determine production of cytokines. ILC2s were sorted from lungs following allergic inflammation. ILC2 numbers were kept at 50,000 cells/well. Tregs sorted from lungs of naive EGFP-Foxp3–knockin mice were added at cell ratios from 50:1 to 1:1 (ILC2/Tregs). Cells were cultured with anti-CD3ε and anti-CD28 (2 μg/ml). Seventy-two hours following stimulation, supernatants were harvested, and IL-13 was analyzed. A similar set-up was used for ILCs and Tregs isolated with or without MaR1 treatment. Naive CD4 T cells were cultured in the presence of anti-CD3– and anti-CD28–specific Abs (BD Biosciences; 1 μg/ml), TGF-β (3 ng/ml; R&D Systems), MaR1 (1 ng/ml), and all-trans retinoic acid (ATRA; Sigma; 1 nM). Cultures were supplemented with ATRA and MaR1 every other day for 5 d.
Murine IL-5, IL-13, amphiregulin, and TGF- β were purchased from R&D Systems and used according to the manufacturer’s instructions. Sera from mice were used for IgE quantification. The Student unpaired two-tailed t test was used for all statistical analyses involving two groups, one-way ANOVA was used to compare differences between groups, and the Dunnett post test was used for multiple comparisons. All statistical analyses were performed with GraphPad Prism. Data shown are mean ± SD. Differences between the groups were considered significant at p < 0.05. All data are representative of at least two independent experiments. Targeted lipid mediator metabololipidomics was performed to identify endogenous molecules involved in the resolution of allergic inflammation. DHA-derived mediators were determined in lung extracts obtained during self-limited murine allergic responses to OVA (Supplemental Fig. 1A). Using reported criteria (7), MaR1 was identified in murine lungs (Fig. 1A). Quantitation using multiple-reaction monitoring demonstrated temporal regulation of lung MaR1, which decreased after allergen challenge and increased during resolution (Fig. 1B). MaR1 is temporally regulated during allergic inflammation. (A) Tandem mass spectrometry spectrum used in the identification of MaR1 (left panel). Representative multiple reaction trace for MaR1 (m/z = 359–250) (right panel). (B) Lung MaR1 levels measured during allergic inflammation. Data in (A) are representative of two independent experiments (n = 3 mice/time point) and data in (B) are mean ± SD. (C) Cell differentials in BALF. (D) Histology of H&E-stained lung tissue (original magnification ×200). (E) OVA-specific IgE measured in serum. (F) Cytokines in BALF measured by ELISA. Results are mean ± SD and are representative of four independent experiments (n ≥ 3 mice/group). *p < 0.05, **p < 0.01. Based on MaR1’s temporal regulation, exogenous administration of MaR1 (1 ng/mouse) during the challenge phase was tested to determine its impact on allergen-triggered inflammation (Supplemental Fig. 1B). MaR1 blunted multiple parameters of allergic inflammation, including significant decreases in bronchoalveolar lavage fluid (BALF) eosinophils (Fig. 1C), tissue inflammation analyzed by histology (Fig. 1D), and OVA-specific IgE levels (Fig. 1E). Type 2 cytokines IL-5 and IL-13 were significantly reduced in BALF with increased TGF-β levels (Fig. 1F). TGF-β plays an important role in skewing CD4+ T cell phenotype (15), so the MaR1-mediated increase in BALF TGF-β (Fig. 1F) suggested an altered T cell profile. Immunoprofiling of lungs following MaR1 revealed that total leukocytes (CD45+) were decreased relative to vehicle treatment, whereas the percentage of CD45+CD3+ cells was increased (Fig. 2A, left panel, Supplemental Fig. 2B). In addition, among CD4+ cells, the percentage of Foxp3+ expression increased with MaR1 exposure (Fig. 2A, right panel, Supplemental Fig. 2C). To determine whether MaR1 increased Ag-specific Tregs, CD4+ T cells from naive spleens of DO11.10 mice depleted of natural Tregs were adoptively transferred into sensitized mice (protocol day 13). MaR1-exposed mice displayed increased Foxp3 expression in CD4+KJ-126+ cells (protocol day 18, Fig. 2B), consistent with de novo generation of Ag-specific Foxp3+ Tregs in vivo by MaR1. MaR1 promotes de novo generation of Foxp3-expressing Tregs. (A) Percentage of CD3 and Tregs (CD4+F+) in lungs. (B) DO11.10 CD4+ T cells (depleted of natural Tregs) were adoptively transferred into sensitized mice prior to aerosol challenge. Ag-specific Tregs were analyzed by flow cytometry. (C) Treg generation from naive CD4+ T cells. (D) Amphiregulin production measured by ELISA. Results are mean ± SD and are representative of three independent experiments with duplicate determinations by ELISA. (E) Flow cytometry of cytokine production by ILCs from allergic inflammation model. Plots are gated for ILC2 (Lin−CD45+Thy1.2+CD25+). The numbers above the gates (red boxes) indicate the percentage of positive cells within the gates. (F) IL-13 and IL-5 (left panel) and amphiregulin (right panel) concentrations from supernatants of lung cells. Data in (A), (B), (E), and (F) are mean ± SD and are representative of three independent experiments (n ≥ 3 mice/group). *p < 0.05, **p < 0.01, ***p < 0.001. To determine whether MaR1 could directly induce Treg generation, naive CD4+ T cells (spleen) were cultured under Treg-inducing conditions (Fig. 2C). MaR1 alone did not promote Treg generation, but there was marked synergy with TGF-β in skewing Treg differentiation (Fig. 2C). Together with TGF-β, MaR1-triggered expression of Foxp3 was similar in amplitude to that induced by ATRA (Fig. 2C). Mean fluorescence intensity for Foxp3 expression in these cells also increased with MaR1 (Supplemental Fig. 2D). In addition, MaR1 influenced Treg production of amphiregulin with additive increases when combined with TGF-β (Fig. 2D). In contrast, amphiregulin was undetectable in naive CD4+ T cell cultures. These findings support a pivotal role for MaR1 in promoting de novo Treg differentiation. 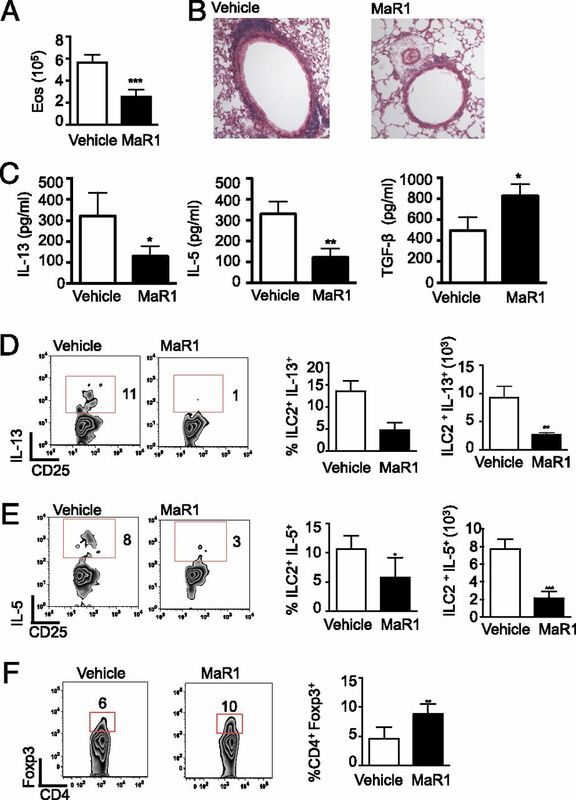 To determine whether MaR1’s regulation of allergic inflammation occurred via the targeting of ILC2s, cytokine production by ILC2s was measured in lungs obtained from mice given MaR1 or vehicle following the last allergen challenge. ILC2s were identified as lineage negative (CD3−CD4−CD8−CD19−CD11b−CD11c−GR1−CD49b−TCRβ−TCRγ/δ−) and CD45+Thy1.2+ST2+CD25+ (see Materials and Methods). ILC2s from MaR1-exposed mice had significantly reduced IL-13 production (Fig. 2E). Release of type 2 cytokines from lung cells following overnight stimulation with IL-7 also was significantly decreased in MaR1-exposed mice (Fig. 2F, left panel). In contrast to type 2 cytokines, MaR1 increased levels of lung amphiregulin (Fig. 2F, right panel), a mediator of mucosal protection (16, 17). CD4+ Th2 cells from MaR1-exposed mice also displayed markedly lower IL-13 production (Supplemental Fig. 2E). These results indicated that MaR1 selectively regulated lung cytokine levels, including decreased type 2 cytokine production by both ILC2s and CD4+ Th2 cells. To assess whether MaR1’s regulation of ILC2s in vivo was via Tregs, ILC2s obtained from allergic murine lungs were cocultured with Tregs isolated from naive lungs. IL-7 stimulation promoted IL-13 release by ILC2s (Fig. 3A, left panel), and increasing ratios of Tregs/ILC2s led to dose-dependent inhibition of IL-13 production by ILC2s (Fig. 3A). This Treg-mediated inhibition of ILC2 was blocked by a SMAD3 inhibitor (SIS3), suggesting a dependence on TGF-β signaling (Fig. 3A, middle panel). MaR1 alone led to concentration-dependent inhibition of ILC2 IL-13 and exerted additive inhibition with Tregs (Fig. 3A, right panel). Together, these findings were consistent with dual mechanisms for MaR1-mediated inhibition of ILC2, both direct and Treg-mediated, with an important role for TGF-β signaling. 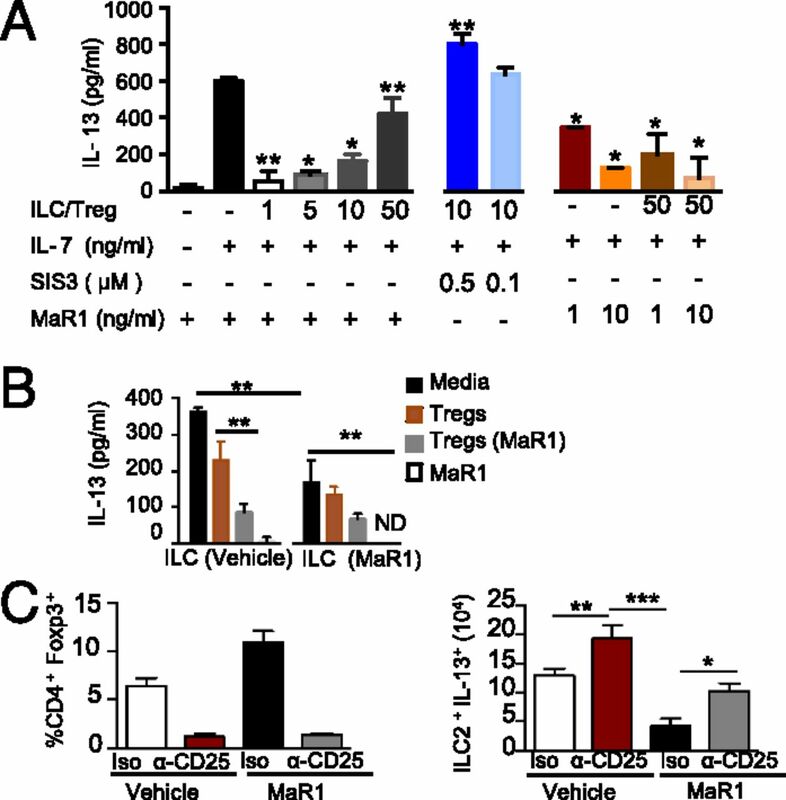 MaR1 and Tregs regulate cytokine production from ILC2s. (A) Lung ILCs were sorted from mice following allergic inflammation. EGFP+ Tregs from lungs of naive mice were added in titrated ratios to specific wells. IL-13 levels were measured 72 h later by ELISA. (B) Lung ILCs and EGFP+ Tregs were sorted from sensitized mice exposed to vehicle or MaR1 just prior to allergen challenge. The ILCs were cultured in the absence or presence of Tregs for 72 h. IL-13 production was measured by ELISA. Results are mean ± SD and are representative of three independent experiments with duplicate determinations. (C) Foxp3 expression on CD4 T cells (left panel) and IL-13 production in lung ILC2s (right panel) following administration of anti-CD25 or isotype control were analyzed by flow cytometry. Results are mean ± SD and are representative of two independent experiments (n ≥ 3 mice/group). *p < 0.05, **p < 0.01, ***p < 0.001. ND, not detected. To determine whether in vivo MaR1 exposure altered Treg and ILC2 functional responses, ILC2s were sorted from lungs following allergic inflammation and exposed to IL-7 in the absence or presence of Tregs isolated from the two groups. The levels of IL-13 were significantly reduced in MaR1-exposed ILC2s compared with vehicle control treatment (Fig. 3B). In addition, MaR1-exposed Tregs were more potent than Tregs from control mice in suppressing IL-13 production by ILC2s. To test the importance of ILC2 suppression by Tregs, an anti-CD25–depleting Ab for Tregs and CD4+ Th2 effector cells was administered prior to aerosol challenge. Foxp3-expressing Tregs were significantly depleted (Fig. 3C, left panel). Anti-CD25 administration, along with the absence of MaR1, resulted in higher IL-13 production than did treatment with the isotype Ab, underscoring the role of Tregs in tempering type 2 allergic inflammation (Fig. 3C, right panel). Potent inhibition of IL-13 levels was seen with administration of MaR1 and isotype Ab, wherein Tregs were preserved (Fig. 3C). Of note, MaR1-mediated suppression of ILC2 production of IL-13 was blunted in the absence of Tregs. These findings are consistent with ILC2s serving as a major source of IL-13 and indicate MaR1’s ability to act directly on ILC2s and potentiate Treg suppressive actions. Given the temporal increase in MaR1 levels during resolution and its regulation of ILC2s and Tregs, the impact of MaR1 on resolution was examined next. Mice were allowed to develop maximal allergic lung inflammation and then MaR1 was given for three consecutive days (days 18–20; Supplemental Fig. 1A), followed by immunophenotyping on day 21. MaR1 administration significantly accelerated the decrease in BALF eosinophils (Fig. 4A) and lung tissue inflammation (Fig. 4B). BALF type 2 cytokines were significantly decreased in MaR1-treated mice, and TGF-β levels were increased (Fig. 4C). During the resolution phase, MaR1 administration resulted in significantly decreased expression of type 2 cytokines (IL-5 and IL-13) by ILC2s (Fig. 4D, 4E) and by CD4+ Th2 cells (Supplemental Fig. 2F). MaR1-treated mice also showed an increased percentage of Tregs during resolution (Fig. 4F). Together with the results in Figs. 1–3, MaR1 prevented the development of allergic lung inflammation and accelerated its resolution by decreasing ILC2 and CD4+ Th2 production of type 2 cytokines and increasing Treg generation and suppressive actions. MaR1 accelerates the resolution of allergic inflammation. Inflammation analyzed on day 21 of protocol. (A) Leukocyte differential counts of BALF cells. (B) Histology of H&E-stained lung tissue (original magnification ×200). (C) Type 2 cytokines and TGF-β levels in the lung BALF were measured by ELISA. IL-13 (D) and IL-5 (E) cytokine production by ILC2s was analyzed by flow cytometry. The numbers next to the gates (red boxes) indicate the percentage of positive cells within the gates. (F) Lung Treg expression was analyzed by flow cytometry. Results are mean ± SD and are representative of three independent experiments (n ≥ 3 mice/group). *p < 0.05, **p < 0.01, ***p < 0.001. The paradigm of asthma being driven solely by the adaptive immune system has been transformed (18, 19); its pathogenesis is significantly influenced by ILC2s serving as an Ag-independent source of type 2 cytokines (18, 19). In this study, targeted lipid mediator metabololipidomics revealed lung production of a natural proresolving mediator MaR1 with spatial and temporal regulation to limit allergic inflammation and ILC2 functional responses. MaR1 is a product of enzymatic conversion of DHA by 12-lipoxygenase, in particular by macrophages during resolution of acute inflammation (7). MaR1’s action on murine ILC2 was notable for suppression of IL-5 and IL-13 and increased expression of amphiregulin. Together, these actions promoted lung catabasis for murine allergic lung inflammation. MaR1 regulation of ILC2 was accompanied by the induction of Tregs from naive CD4+ T cells. When isolated from MaR1-treated mice, the Tregs were more potent in suppressing IL-13 production from ILC2s. IL-13–producing ILC2s in the lung were far fewer in number than Tregs, even in allergic inflammation, suggesting that ILC2 effector function is a rational target for induced Tregs. Our in vitro data also indicated that MaR1 had a direct inhibitory effect on ILC2 effector function, suggesting that, in the absence of an adaptive immune response (e.g., SCID or RAG-deficient mice), MaR1 would still exert an inhibitory effect. The suppressive mechanism mediated by Tregs involved TGF-β signaling, because addition of a SMAD3 inhibitor reversed Treg inhibition. It is possible that MaR1 enhanced the suppressive function of Tregs by inducing select transcription factors like Itch, which can modulate allergic responses (20). 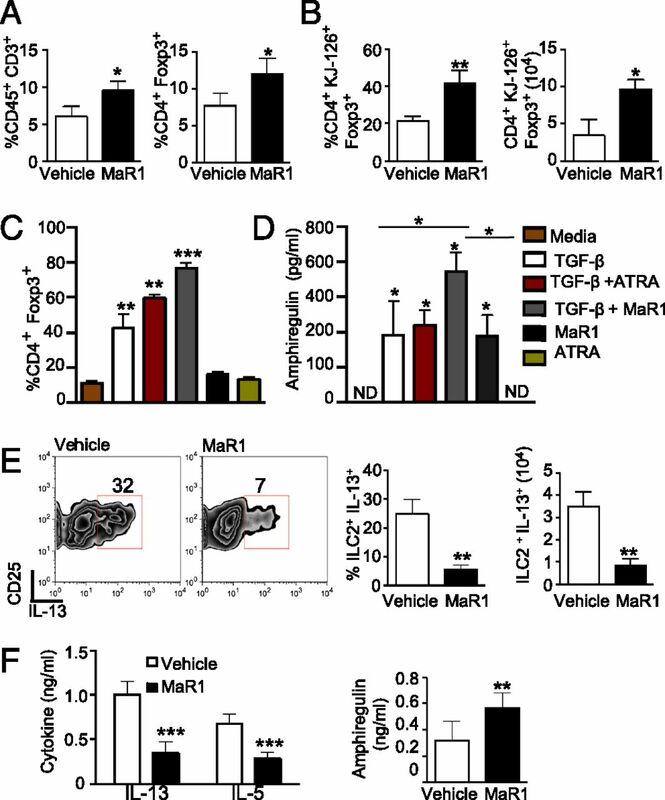 In conjunction with the results from in vivo depletion of Tregs disrupting MaR1-mediated suppression of ILC2 function, this study uncovered interactions between regulatory immune effectors and a SPM (MaR1) to control lung inflammation, identifying a new proresolving cellular mechanism and suggesting a new small molecule or cell-based therapeutic strategy for allergic inflammation that engages MaR1-conditioned Tregs to control ILC2 and CD4+ T cell effector functions. C.N.S. is an inventor on patents (resolvins) assigned to Brigham and Women’s Hospital and licensed to Resolvyx Pharmaceuticals, was a scientific founder of Resolvyx Pharmaceuticals, and owns founder stock in the company. B.D.L. is an inventor on patents (resolvins) assigned to Brigham and Women’s Hospital and licensed to Resolvyx Pharmaceuticals. C.N.S.’s and B.D.L.’s interests were reviewed and are managed by the Brigham and Women’s Hospital and Partners HealthCare, according to conflict-of-interest policies. The other authors have no financial conflicts of interest. We thank GuangLi Zhu and Bonna Ith for technical assistance. We also thank Yiling Qui and Deneen Kozoriz for technical assistance with sorting of ILCs and Tregs. This work was supported in part by National Institutes of Health Grants P01-GM095467 (to B.D.L. and C.N.S.) and HL122531 (to B.D.L.).
. 2010. Functions of T cells in asthma: more than just T(H)2 cells. Nat. Rev. Immunol. 10: 838–848.
. 2014. Group 2 innate lymphoid cells are critical for the initiation of adaptive T helper 2 cell-mediated allergic lung inflammation. Immunity 40: 425–435. Barlow, J. L., A. Bellosi, C. S. Hardman, L. F. Drynan, S. H. Wong, J. P. Cruickshank, and A. N. McKenzie. 2012. Innate IL-13–producing nuocytes arise during lung inflammation and contribute to airways hyperreactivity. J. Allergy Clin. Immunol. 129: 191–198.e1–4.
. 2012. IL-33-responsive lineage- CD25+ CD44(hi) lymphoid cells mediate innate type 2 immunity and allergic inflammation in the lungs. J. Immunol. 188: 1503–1513.
. 2011. The expanding family of innate lymphoid cells: regulators and effectors of immunity and tissue remodeling. Nat. Immunol. 12: 21–27. 2014. Staying innate: transcription factor maintenance of innate lymphoid cell identity. Immunol. Rev. 261: 169–176.
. 2009. Maresins: novel macrophage mediators with potent antiinflammatory and proresolving actions. J. Exp. Med. 206: 15–23.
. 2012. Innate lymphoid cell interactions with microbiota: implications for intestinal health and disease. Immunity 37: 601–610.
. 2014. Proresolving lipid mediators and mechanisms in the resolution of acute inflammation. Immunity 40: 315–327. Barnig, C., M. Cernadas, S. Dutile, X. Liu, M. A. Perrella, S. Kazani, M. E. Wechsler, E. Israel, and B. D. Levy. 2013. Lipoxin A4 regulates natural killer cell and type 2 innate lymphoid cell activation in asthma. Sci. Transl. Med. 5: 174ra26.
. 2004. Association of cystic fibrosis with abnormalities in fatty acid metabolism. N. Engl. J. Med. 350: 560–569.
. 2012. Resolvin D1 and aspirin-triggered resolvin D1 promote resolution of allergic airways responses. J. Immunol. 189: 1983–1991.
. 2007. Protectin D1 is generated in asthma and dampens airway inflammation and hyperresponsiveness. J. Immunol. 178: 496–502.
. 2013. The novel 13S,14S-epoxy-maresin is converted by human macrophages to maresin 1 (MaR1), inhibits leukotriene A4 hydrolase (LTA4H), and shifts macrophage phenotype. FASEB J. 27: 2573–2583.
. 2011. Innate lymphoid cells promote lung-tissue homeostasis after infection with influenza virus. Nat. Immunol. 12: 1045–1054.
. 2013. IL-9-mediated survival of type 2 innate lymphoid cells promotes damage control in helminth-induced lung inflammation. J. Exp. Med. 210: 2951–2965.
. 2013. Type 2 innate lymphoid cells control eosinophil homeostasis. Nature 502: 245–248.
. 2014. Innate lymphoid cells and asthma. J. Allergy Clin. Immunol. 133: 943–950, quiz 51. 2013. Regulatory T cells use “Itch” to control asthma. J. Clin. Invest. 123: 4576–4578.